A 12-year “hurricane drought” during which no major hurricanes formed in the Atlantic ended dramatically in 2017. The devastating impacts of Harvey, Irma, Jose and Maria across the United States and the Caribbean provide tragic reminders of the catastrophic risks we face on our coasts. Coastlines are being developed rapidly and intensely in the United States and worldwide. The population of central and south Florida, for example, has grown by six million since 1990. Many of these cities and towns face the brunt of damage from hurricanes and are looking for better and cheaper ways to reduce their risks. Yet this rapid coastal development is destroying natural ecosystems like marshes, mangroves and coral reefs – resources that help protect us from catastrophes. In a new and unique partnership funded by Lloyd’s of London, we worked with colleagues in academia, environmental organizations and the insurance industry to calculate the financial benefits that coastal wetlands provide by reducing storm surge damages from hurricanes. Our recently published study found that this function is enormously valuable. It offers new evidence that protecting natural ecosystems is a cost-effective way to reduce risks from coastal storms and flooding. 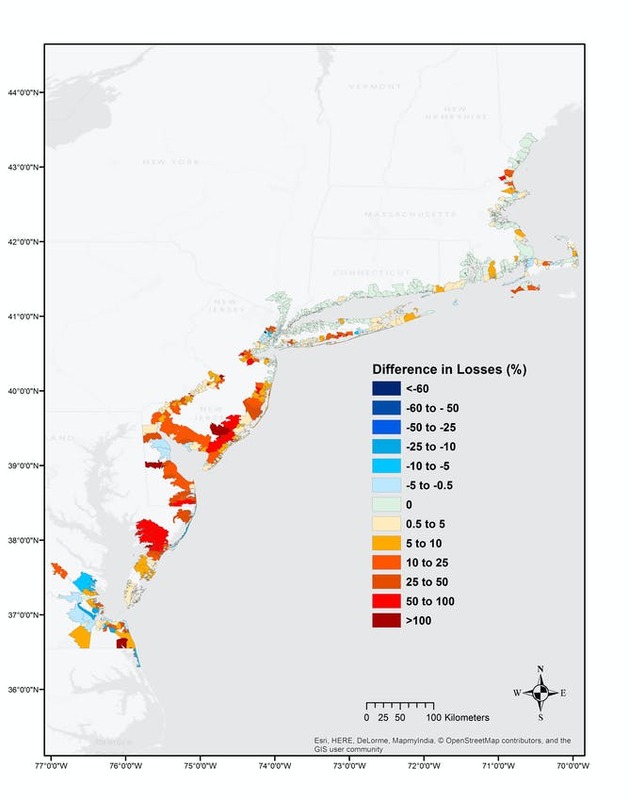 Using the industry’s storm surge models, we compared the flooding and property damages that occurred with wetlands during Hurricane Sandy to the damages that would have occurred if these wetlands were lost. First we compared the extent and severity of flooding during Sandy to the flooding that would have happened in a scenario where all the coastal wetlands were lost. Then, using high-resolution data on assets in the flooded locations, we measured the property damages for both simulations. 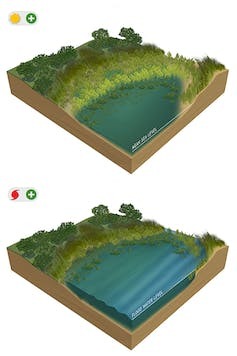 The difference in damages – with wetlands and without – gave us an estimate of the damages that were avoided due to the presence of these ecosystems. Our paper shows that during Hurricane Sandy in 2012, coastal wetlands prevented more than US$625 million in direct property damages by buffering coasts against its storm surge. Across 12 coastal states, from Maine to North Carolina, wetlands and marshes reduced damages by an average of 11 percent. These benefits varied widely by location at the local and state level. In Maryland, wetlands reduced damages by 30 percent. In highly urban areas like New York and New Jersey they provided hundreds of millions of dollars in flood protection. Wetlands reduced damages in most locations, but not everywhere. In places in North Carolina and the Chesapeake Bay, wetlands redirected the surge in ways that protected properties directly behind them, but caused greater flooding to some properties, mainly in front of the marshes. Just as we would not build in front of a seawall or a levee, it is important to be aware of the impacts of building near wetlands. Our study demonstrates that we can measure the reduction in flood risks that coastal ecosystems provide – a concern that is central for the risk and insurance industry and for coastal managers. We show that these risk reduction benefits are significant and make a strong case for conserving and protecting our coastal ecosystems – an issue central to conservation practitioners. The next step is to use these benefits to create incentives for wetland conservation and restoration. Homeowners and municipalities could receive reductions on insurance premiums for managing wetlands. Post-storm spending should include more support for this natural infrastructure. And new financial tools such as resilience bonds, which incentivize investments in measures that reduce risk, could support wetland restoration efforts too. As communities in Texas, Florida and the Caribbean assess their losses, the conversation is starting to turn toward rebuilding and improving resilience against future storms. It is human nature to want to return to the status quo after a disaster. More often than not, this means rebuilding seawalls and concrete barriers. But concrete walls are expensive, will need constant upgrades as sea levels rise and will further damage our natural ecosystems. Even after suffering years of damage, Florida’s mangrove wetlands and coral reefs play crucial roles in protecting the state from hurricane surges and waves. And yet, over the last six decades urban development has eliminated half of Florida’s historic mangrove habitat. Losses are still occurring across the state from the Keys to Tampa Bay and Miami. Protecting and nurturing these natural first lines of defense could help Florida homeowners reduce damages to their properties during future storms. Protecting coastal ecosystems is not a full remedy for coastal risks, but it should be part of a portfolio of solutions, from elevating buildings to strengthening levees to flood proofing. Beyond hurricane season, coastal communities face a crucial question: whether they can rebuild in ways that make them better-prepared for the next storm while also conserving their natural resources. Our work shows that the answer is yes.